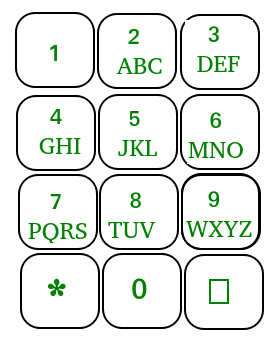 Given a keypad as shown in diagram, and an N digit number. List all words which are possible by pressing these numbers. The first line of input contains an integer T denoting the number of test cases. T testcases follow. Each testcase contains two lines of input. The first line of each test case is N, N is the number of digits. The second line of each test case contains D[i], N number of digits. Print all possible words from phone digits with single space.